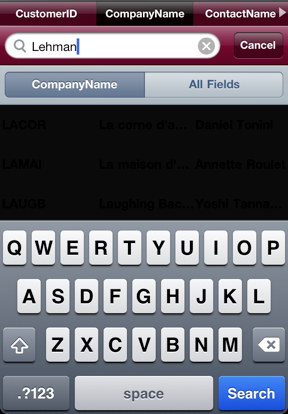 The quick search bar at the top of any record list allows simple searching in the current table against a single field. You can access the search bar by going to any record list screen and sliding your finger downwards on the screen until the search bar appears. 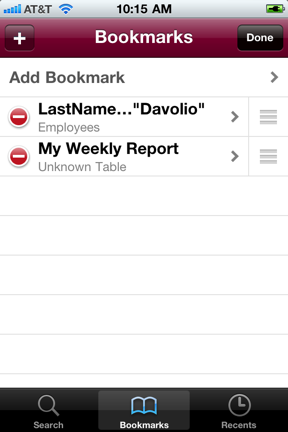 The column that you search against is controlled by which column you have selected in the column header list at the top of the screen. ☞ Note: searching in most database is case-sensitive, so searching for “apple” will not find records with the name “Apple”. 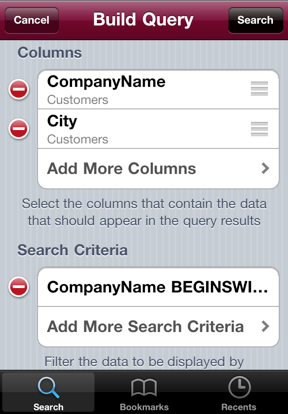 The query builder is accessible by tapping the search icon in the upper-right corner of any schema list, table list, or record list. It provides the ability to create sophisticated queries across multiple tables and with multiple criteria and sorting options. ☞Note: In addition to being able to specify your search columns and join criteria, you can also enter completely custom SQL in the editor at the bottom of the search screen. Your recent searches are visible by tapping the “Recents” tab in the search screen. In addition, you can create and arrange bookmarks for your favorite queries so you can re-execute them easily in the future. You can enter any freeform SQL that your database can handle by opening the Query Builder and selecting “Custom SQL Query” at the bottom of the screen. Queries entered this way will be added to your search history and can be bookmarked like any other query. 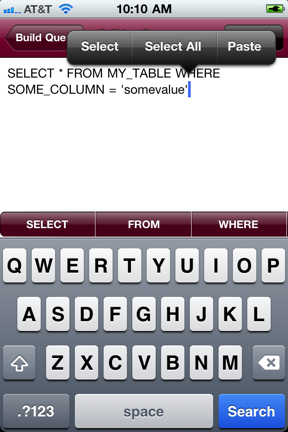 ☞Note: Since entering long text on an iOS device can be tedious, you might want to consider composing the SQL query on a desktop computer and then e-mailing it to yourself, then copying & pasting the query from your e-mail into the custom SQL query text field.